Stadiums, canals, bridges, towers. As the host of the Discovery Channel’s Build it Bigger (now on the Science Channel, Thursdays at 8 p.m.), Danny Forster waxes ebulliently over chest-beating, landscape-altering, marvel-of-engineering hugeness. But the Harvard-trained architect who runs his own design studio between TV gigs is every bit as enthusiastic about small, sustainable construction. Proof is in Omena where Forster is overseeing the finishing touches on a beach house he designed (in association with Boston designer Kiel Moe) for family friends. 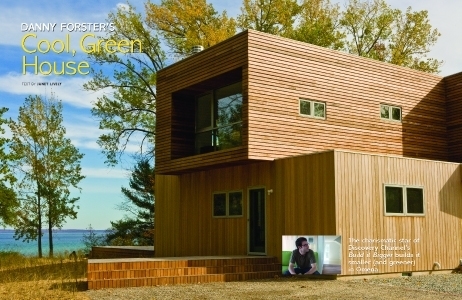 The modest-sized modern home, Forster’s first single-family dwelling, has earned a gold LEED certification from the U.S. Green Building Council. On a fast-walking, faster-talking tour of the house (watch Danny on video showing the house under construction and later, when it was completed), Forster introduces workers by name and praises everyone from the builder to the drywall guys for their willingness to improvise and experiment. The joke about the affable Forster is that he really loves to talk, and sustainable design is a topic that gets him particularly cranked. True sustainable housing depends less on pricy green technology than on commonsense architecture and careful material choices, Forster explains. The design began with a footprint of 1,400 square feet and no-brainer orientation: Bedrooms and public rooms face east for morning sun and the view of Lake Michigan. From there, Forster put an open stairway in the sun-fried southwest corner and ran upstairs hallways along the hottest walls. The kitchen is positioned in the northwest corner to take advantage of the early evening light without the direct sun that makes summer cooking uncomfortable even in an air-conditioned house. Accommodating the sun is ancient architecture, perfected by the Romans, Forster says. But his B.C. design is updated with PC software that analyzed the prevailing winds to determine the optimal placement and size of the windows. By opening and shutting the casement windows, homeowners can draw lake breezes through the house all day. Buy the Danny Forster Issue and get more home features, more green ideas and the August issue of Traverse, Northern Michigan’s Magazine. Just click on the photo! Two sections of living roof further cool the house, moderating the burning temperatures that plague traditional rooftops. The plants and growing medium, along with wind, shade, and orientation, will keep the house comfortable 95 percent of the summer, Forster says. On really scorching days, homeowners can flip on an innovative geothermal-powered in-ceiling radiant cooling system that pipes water through hydronic coils located above the ceiling. Variations of the system have been used in European commercial buildings, but Forster says that as far as he knows, the Omena home is the first time in-ceiling radiant cooling has been used anywhere residentially. The system, says Forster, is “greener, more efficient and better for the body,” than traditional air conditioning. The sustainable design cost no more per square foot than comparable custom-built houses on Lake Michigan. The flat roof, simple windows, standard dimensions (sized to the width of plywood to minimize waste), and a central channel for plumbing and mechanicals resulted in framing that was fast and cheap and allowed budgeting for special features including commercial-grade kitchen appliances. “They got a whole lot more house for the money,” says Dave Bradshaw, project supervisor for builder Paul Maurer General Contracting. Indeed Forster didn’t sacrifice style in his efficient design. In his modern mien, he uses geometry and texture to create visual interest by, for example, setting the two boxes that make up the home’s structure slightly off square. He connects them on the ground floor with a trapezoidal (almost) breezeway that leads from the entrance to the deck. Outdoor ipe decking is used on the breezeway floor and ceiling, drawing visitors out toward the water. An ipe rain screen runs across the windows on the sunniest corner of the house, providing afternoon shade. At night, light shining from the inside of the house through the ipe slats makes the house glow like a Japanese lantern. A wall of lightweight, energy efficient glass panels, called a NanaWall, folds up accordion-style in good weather to meld the deck and living room into one large open air space. “There is no ‘in’ and no ‘out’ here,” Forster says. “The house is inextricably linked to the landscape.” A sentiment that is perhaps the ultimate measure of a sustainable house. Walk the house with Danny while it was under construction and you’ll be instantly swept up in his enthusiasm and passion for green building. Plus you’ll get an inside look at some cool ideas. Then stop back with him when the house was completed and listen as he shares what is so cool about the finished product. Read More About Homes Up North! Mark Your Calenders for the 2009 Ultimate Up North Kitchen Tour!